USB Wired Thin, Super Stable, Secure, Water Resistant and Reliable PC, Mac, Apple, Linux, and some tablets basic mouse functions and glide extend for unlimited drag-n-drop (BONUS to PC users download free easy to use software for Multi touch gestures, 8 Scrolling Options, Speed, Acceleration, Programmable Corner Zone, Programmable Gestures and More! Offices, Schools, Restaurant Kitchens, Automobiles, Workshops, Military, Hospitals, Kiosks, Hotels, Online Gambling, Capacitive touch sensing means there is no pressure needed just a feather lite touch, move the cursor with ease, no clicking or pressing a button just a lite tap on the surface for left/right click, Helpful for People with Disabilities, Tendinitis, R.S.I. Repetitive Stress Injury, Accident Victims and Recommended by Physical Therapists, Only Trackpad Used by US Navy on Submarines. Download free software. Supports Windows gestures. Does everything your mouse does and more. 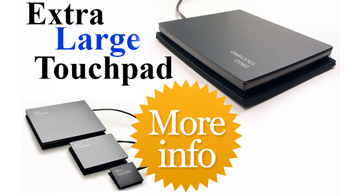 The Ergonomic touchpad is a suite of Wired USB trackpads in different sizes including the mini touchpad the worlds smallest computer mouse. They automatically work on all computers by simply plugging them in, plug n play giving you basic mouse functions and Glidepoint for unlimited dragging, (BONUS to PC users download free easy to use software for Multi touch gestures, programmable features and more..) The worlds most versatile touchpad mouse! Although similar to the cirque cat touchpad, Apple magic trackpad, and bamboo touchpad, the ergotouchpad has no bulky housing, it is all pad and fits in places others won't. This USB system is the most reliable of all touchpads it works with Ethernet USB repeaters cat 5 cat 6. It comes with a 6 foot USB cord that offers more security and less hassle with no need for recharging or replacing batteries, for situations when wireless is not practical. This is one of the reasons it is used by military, government, industrial, financial and universities around the world. Just peel off the foam pad it sits on tabletops with and the velcro back keeps it thin and easily attachable to any surface with the included velcro sticker. Components like keyboard clips, the remote control, and stylus make it fit seamlessly into your fast paced ergonomic lifestyle. 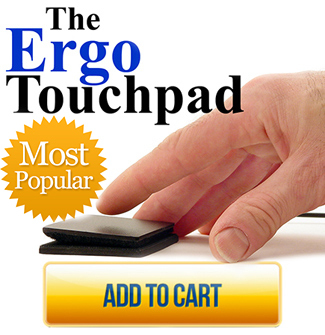 Ergo Touchpad is truly the Magic Trackpad for PC. Glide point technology combined with ergonomic freedom! 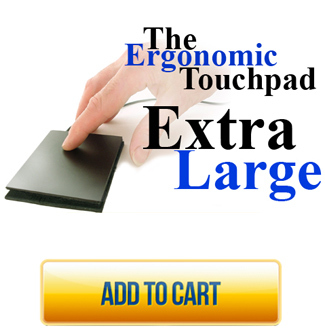 The standard Ergo touchpad $34.95 is our most popular and number one seller you can't beat it for value and performance. If you have a little more space the Extra Large Touchpad is our number two seller with the benefit that you have more room to swipe your finger for longer cursor movements. Most Popular Trackpad, Works on all computers just plug it in for basic mouse functions and glide extend for unlimited drag-n-drop (BONUS to PC users download software for Multi touch gestures and more) It's low profile ergonomic design means less hand movement and more comfort. 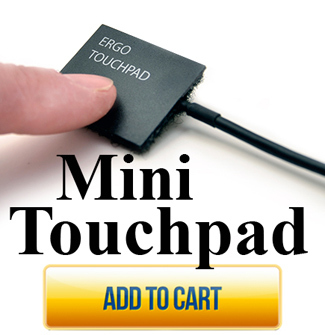 The worlds smallest touchpad! Fits anywhere, about the size of a postage stamp 1.1 x 1.3 inches Thin, Water Resistant, Durable and fast, Works on all computers. Same functions as the standard sized Ergonomic Touchpads but with left and right tap buttons enclosed in a plastic housing. PC get multi touch gestures and more with free easy to use software, double tap for right click and you can program the buttons and corner tap zone to one of over 42 functions like middle click, cut and paste and more. 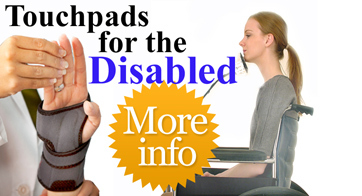 The Ergo Touchpad is a lifeline for many people with disabilities. Whether struggling with R.S.I. repetitive stress injury, temporarily recovering from an accident or dealing with more long term afflictions. 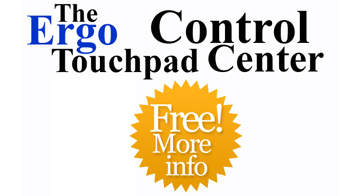 The Ergo touchpads work on many tablets so you can control them from a distance without the use of your fingers on the touch screen. Plug it in USB and a cursor arrow appears allowing you to operate it more like a computer for situations when touch screen use is not possible. Email us your photo and we will make you a custom trackpad, Company logos, family pics, pets, selfies, or just cool designs! Photo touchpads have all the amazing features of the standard Ergo Touchpads, peel off foam pad, extra sticky pad so you can stick it anywhere, Works on all computers basic mouse functions. 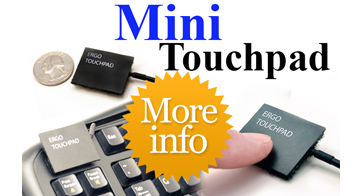 Multi touch gestures, programmable options and more for PC with Free easy to use software. 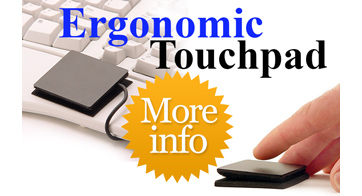 Ergo touchpad's stylus makes precise movements easy and fast. 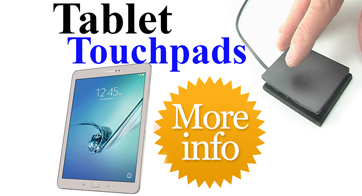 It conducts your own body's natural electric charge from your hand to the tip of the stylus. The special ball end design gives maximum trackability. 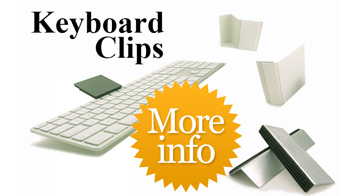 Keyboard clips put the Ergonomic Touchpad anywhere on your keyboard and speed up typing by reducing the amount of time your hand spends reaching for the mouse. Create a smoother flow as you type and a more comfortable and satisfying computer experience. More options and programmable features than any trackpad on the market. Our touchpads work automatically when plugged in giving you all the basic mouse functions and glide extend for unlimited dragging, BONUS to Microsoft PC users download our free easy to use control center software for Gestures, two finger right tap and pan, programmable right tap zone, speed, acceleration, 8 different scrolling options, rotation 90, 180 or 279 degrees, programmable gestures, motion extenders, TouchGuard and more. NOTE: The Mini USB is the same as the PS2 mini but with a USB adapter cable.